Ask anyone who has completed the 4th grade in California schools, "What is the most memorable cultural icon of the state?" The invariable answer is, "the California missions". Whether you made a model of one of the missions of sugar cubes for a class assignment, visited one or more of the 21 Franciscan foundations, or have seen movies based on early California, the missions remain the symbol of the heart and soul of early California. No one would question their importance in the minds of Californians desperately seeking roots and a meaningful image of themselves. In fact, images of these same missions were the primary factor in attracting large numbers of Americans to California between 1890 and 1940. They gave rise to their very own modern architectural traditions in numerous railway stations, public buildings, and private homes. Today, California's missions are faced with several difficult situations. Most of the missions have formed the nucleus of towns, the church becoming the center of an active growing parish. At these missions, it is easy to forget that the original foundation was a large self-contained community, raising its own crops and farm animals, housing hundreds of neophyte Indians, manufacturing pottery, textiles, metal goods, and other necessary items. All missions show the wear and tear of normal aging. A little of this is attractive to the visitor, but all are located in a seismically active zone. How do you retrofit a church to make it safe for modern parishoners while respecting the historical integrity of the building? This is a difficult, complex, and expensive problem. In addition, parishes never have sufficient funds to do all the work desirable at the missions and are fearful of accepting public funds for fear of government controls. These problems are endemic to the very nature of the missions. A new threat has now appeared to threaten these venerable establishments. The religious nature of the missions can apparently no longer protect them in the modern world from the ravages of common thievery. In increasing numbers, articles of value are disappearing from mission museums and even from churches themselves. Luiseho Indian baskets were stolen from the assistencia of Pala in San Diego County, as was a bell from Mission Dolores, since returned when recognized in an antique store. Theft from religious sites is not confined to the Franciscan missions. A bell was also stolen from the Russian Orthodox Cathedral in San Francisco. A student reported seeing a page torn from a mission songbook for sale in a Ventura antique shop. With limited funding and limited staff, mission museums and churches often must be left unattended. Visitors wander through the complexes unsupervised. Glass cases and low fencing provide little protection to a determined thief. At Mission Santa Barbara, several Indian baskets were stolen from a kitchen display in the museum. At least some of these were Chumash and extremely valuable. The thief scaled a fence and knew exactly what was of greatest value. Since this is a rather "busy" mission, his risk of detection by other visitors was high. There is evidence that the thief blocked open a door to the museum so that he could return at a more opportune time. The baskets must have been removed in a bag or container. Missions San Miguel and San Antonio have been particularly hard hit by thieves. The Mission San Miguel museum was the victim of thefts during three successive years. They were not break-ins, but occurred during normal open hours. Each occurred at the same time of year, a period when most of the mission staff were absent. This is a strong indication that the same person, someone familiar with mission routine, was involved in all three thefts. Easy freeway access combined with low security and a low visitor rate aided the thief. In 1997, the left side of a wooden 17th century tabernacle door, ca. 35 x 23 inches, with painted figure in carved relief, was stolen. In 1998, an 18th century head from a gilded carved and painted wooden madonna figure disappeared. The latest theft in 1999 consisted of an 18th century Mexican oil painting of St. Anthony, ca. 19.5 x 13 inches, which was cut out its frame and presumably rolled up by the thief. 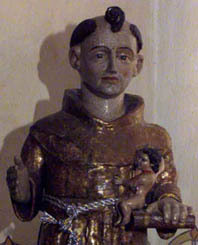 At Mission San Antonio, a statue of St. Anthony holding a baby Jesus was stolen in 1999 around Labor Day from the church baptistry. The child figurine appears to have been taken first. The thief then returned for St. Anthony. While the church is unattended when not in use, we hope that someone will remember a person carrying a large statue out to their car at the appropriate time. Those who signed the guest register are being questioned. Like San Miguel, San Antonio does not have funds or staff to maintain a constant watch on museum or church and visitor rate is low. However, San Antonio's remote location in the middle of an Army base and the military's legal ability to search vehicles and control access poses greater risks to the thief. How can we best tackle this problem? It is not a question of preventing break-ins, since the thefts occur during working hours. Increasing staff is an expensive option and requires continuing expense to the parish. A better solution, already used in libraries and clothing stores, involves attaching sensors to each item. If the item is removed from the premises without desensitizing, an alarm will sound. This is an expensive but one-time cost. Some way would have to be found of secreting the sensor inside the object (statue, picture frame, etc.) to prevent its detection and removal. Staff should be briefed to respond immediately and in force to an alarm. Such a response will probably cause the thief to abandon his prize and flee the scene. He can then best be apprehended by Highway Patrol or Military Police. Another option might employ electronic surveillance, providing a record of thefts on video tape.Another useful strategy is to make disposal of the stolen property more difficult and risky for the thief. In this spirit, we are circulating detailed descriptions of the items stolen from Santa Barbara, San Miguel, and San Antonio on the internet, in appropriate journals, and as fliers to alert those involved in fine arts and antiquities to help us apprehend the thief. Please examine the photos on this webpage and keep them on file for reference.